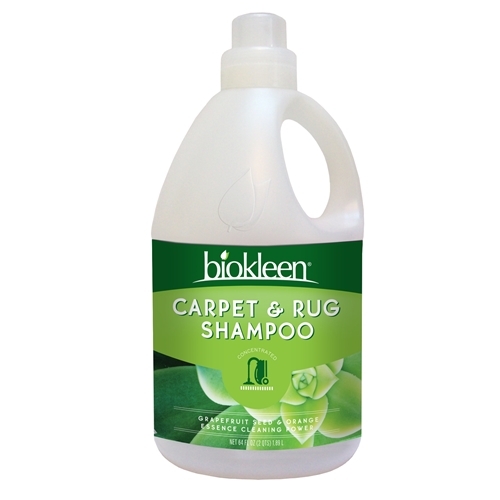 BioKleen's Carpet and Rug Shampoo is safe for all washable fibers and is gentle on backings and pads. Safe for most types of surfaces, cleans and rinses effectively with hot or cold water, and leaves no harsh residues or fumes behind. Contains NO: phosphate, chlorine, ammonia, petroleum solvents, Alcohol, butyl, glycol ether, SLS or SLES, EDTA, DEA, No SARA Title III, CA 65, or EPA priority pollutants. Mo materials listed by the ACGIH as hazardous. Ingredients: Surfactants from coconut and/or corn. grapefruit seed and pulp extract, orange peel extract, linear sulfonate, filtered water.